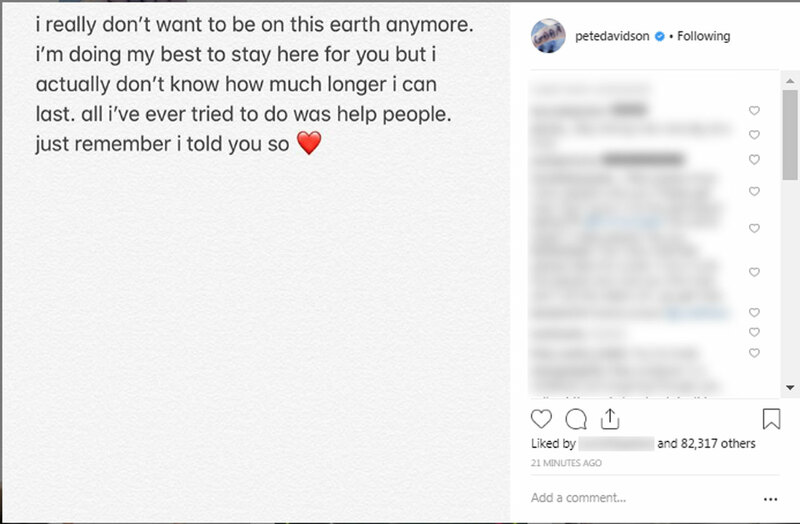 Actor and comedian Pete Davidson is okay after posting a message to his Instagram account that led some to believe the "Saturday Night Live" cast member was contemplating self-harm. NEW YORK -- Actor and comedian Pete Davidson is accounted for after posting a message to his Instagram account that led some to believe the "Saturday Night Live" cast member was contemplating self-harm. "i really don't want to be on this earth anymore. i'm doing my best to stay here for you but I actually don't know how much longer I can last," Davidson wrote Saturday in a now-deleted post. "all I ever tried to do was help people. just remember I told you so." Davidson's entire account disappeared shortly thereafter; it's not clear if he deleted the account or if it was taken down. A New York Police Department spokesperson confirmed to ABC News that officers performed a "wellness check" Saturday at NBC headquarters in Manhattan and "made contact." A "Saturday Night Live" spokesperson also confirmed that Davidson was "in the building late Saturday," ABC News reported. Representatives for NBC declined to comment. The network is set to air a new episode of "Saturday Night Live" on Saturday evening, though it's unclear if Davidson will appear on the program. As news of Davidson's post spread, public figures flooded social media with messages of support. Davidson has recently spoken out about his struggles with borderline personality disorder and depression. Davidson, who was briefly engaged to pop singer Ariana Grande, said in early December that he'd been getting bullied online and in public for nine months. Davidson said he's spoken about being suicidal publicly "only in the hopes that it will bring awareness and help kids like myself who don't want to be on this earth." In response to his comments, Grande said she cares "deeply about Pete and his health." She asked people "to please be gentler with others."